Meet your guide and driver in the morning for a City Tour of St. Petersburg. St. Petersburg is one of the most fascinating cities in Europe. You will drive by the elegant buildings on the Nevsky Prospect, stately palaces on Palace Embankment along the Neva River, Palace Square with Winter Palace and Alexander Column, Bronze Horseman - the famous monument to Peter the Great, Admiralty, Schmidt Bridge, Strelka with Stock Exchangeand Rosstral Columns, St. Isaac's Cathedral, Peter and Paul Fortress, Alexander Nevsky Lavra, Canal Griboyedova, Fontanka, Kazan Cathedral, Church on Spilled Blood and other finest architectural, historical and cultural landmarks. During the tour you will visit Peter and Paul Fortress and St. Isaac’s Cathedral. Peter-and-Paul Fortress was built in 1704 to defend the city from naval attacks; however it never served its purpose. Instead its history is rather gruesome: thousands of laborers died while building the fortress, many political prisoners, including Peter's own son Alexi, were kept and tortured in its cells, and the tombs of the Romanov family are in its Cathedral. St. Isaac’s Cathedral is one of the world’s largest Cathedrals and can accommodate an audience of about 10,000 people. It was designed by then unknown architect Auguste de Montferrand and opened in 1858. The Cathedral is beautifully decorated inside with marble of 13 colors, malachite, lapis-lazuli, paintings, mosaics and stained glass made by the most famous Russian artists. 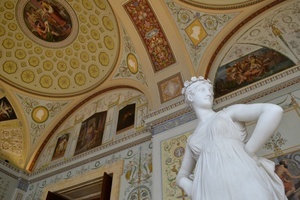 Today you will enjoy a private tour of one of the nation's main glories - the State Hermitage Art Museum. It occupies six magnificent buildings situated along the embankment of the Neva River, right in the heart of St Petersburg. 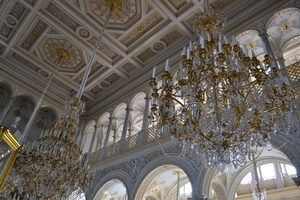 The leading role in this unique architectural ensemble is played by the Winter Palace, the residence of the Russian tsars built according to the design of Francesco Bartolomeo Rastrelli in 1754-62. 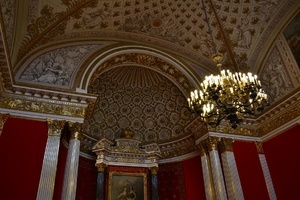 This ensemble is extended by the eastern wing of the General Staff building, the Menshikov Palace and the recently constructed Repository. Put together throughout two and a half centuries, the Hermitage collection consists of over 3,000,000 works of art and presents the development of the world culture and art from the Stone Age to the 20th century. 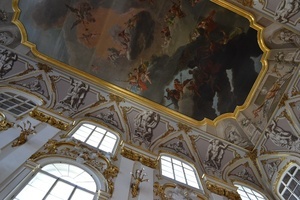 In the afternoon you are free to continue exploring the Hermitage on your own or enjoy St. Petersburg. After breakfast tour to the Petergoff (formerly known as Petrodvorets), located on the southern shores of the Finnish Gulf 14 miles (29 kilometers) away from St. Petersburg. The history of Petergoff began in 1704 when Peter I built a wooden house on the Gulf while overseeing the construction of the nearby Kronstadt Fortress. 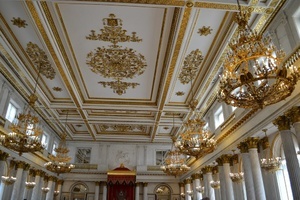 In 1713 he began transforming the area into an imperial residence. The Grand Palace was inaugurated in 1723 and later expanded by Empress Elizabeth. 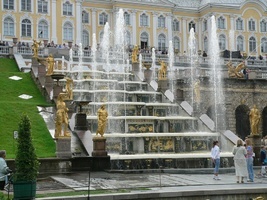 The Palace is surrounded by a beautiful park famous for its fountains. There are 144 of them, all operating without the use of pumps by a combination of naturally generated water pressure and magic. Each fountain is unique and once you step in the kingdom of fountains you will be surprised by this splendid beauty created by a man. 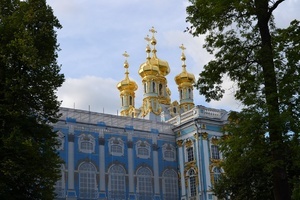 All day tour to Pushkin located 25-30 km from St. Petersburg. Pushkin's palaces and parks were created under Empresses Elizabeth and Catherine the Great between 1744 and 1796. The main landmark is the Catherine Palace designed by Rastrelli and named after Elizabeth’s mother, Peter the Great's second wife. Pushkin's original name is Tsarskoye Selo (Tsar's Village). It was renamed in 1937 after Russia’s famous poet who used to study here. Free afternoon. Dora handled everything superbly on the USA end. Intercontinental Hotel in Moscow was excellent. My single room in the Nevsky Forum was cramped. Will highly recommend East-West tours to anyone considering Russia.